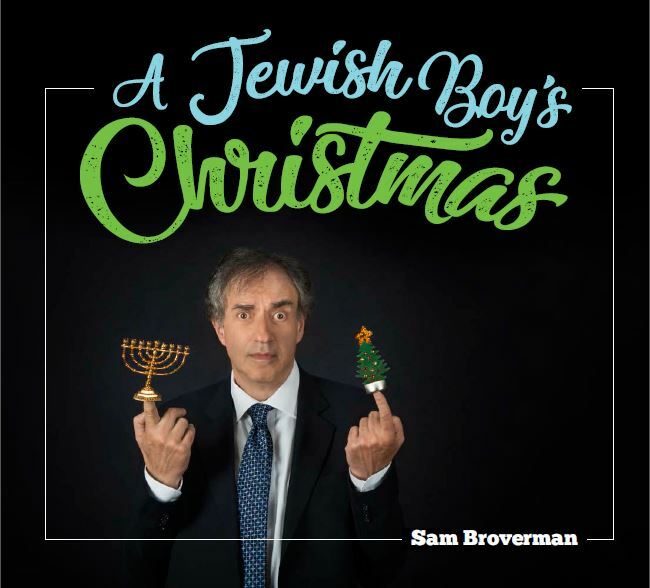 For almost ten years now, Winnipeg born, Toronto based singer Sam Broverman has been presenting his cabaret show A Jewish Boy’s Christmas every holiday season. Initially inspired by the fact that many of the best known Christmas songs were written by Jewish songwriters, the show has evolved into a well loved holiday revue driven by Sam’s love for comedy and novelty song. After almost ten years – and countless requests – it was time to record an album. For A Jewish Boy’s Christmas – his fourth full length album – Sam enlisted the help of several of Toronto’s best musicians, including his working band with Peter Hill and Jordan O’Connor. Featured as a guest soloist is Broverman’s regular special guest, Whitney Ross-Barris, the Toronto jazz and theatre scene stalwart whose wit is widely known. Ken Whitely – the multiple award-winning Canadian music legend- was invited onboard to produce the whole affair after his involvement in the inaugural show. Having celebrated the work of great songwriters like Johnny Mercer and Jimmy Van Heusen on his previous recordings, it was time for Sam to return to one of his first loves: parody songwriting. In addition to working as a singer, Sam is also a professor of actuarial mathematics at the University of Toronto – he put himself through school singing, and has delivered his book of math based parody songs at academic conferences for years. A Jewish Boy’s Christmas is a hilarious and irreverent take on the holiday season.